IPI 2017: Are we winning against corruption? 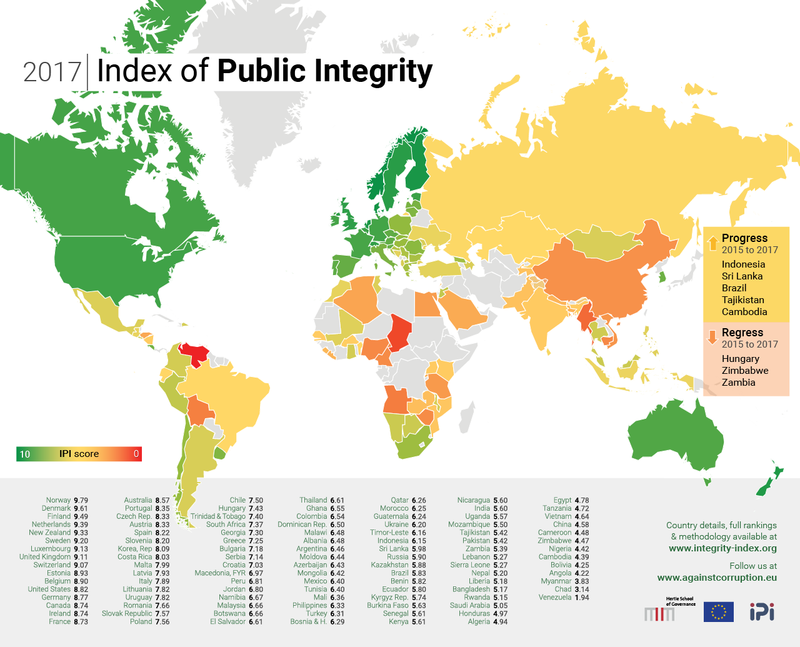 The 2017 Index of Public Integrity shows stagnation, with minor progress in reducing red tape or increasing the demand for good governance, but regress on freedom of the press and of trade, two indispensable components of control of corruption. The index correlates at over ninety per cent with control of corruption, innovation capacity and government effectiveness, showing corruption as the major factor subverting development. 2017 was a mixed year for anticorruption. On one hand, Brazil proved to the world that countries can put an end to the culture of impunity, which still exists in so many, and France moved decisively out of the hypocrisy so often associated with developed countries of late by tackling conflict of interest for its politicians. Demand for good governance has increased in many countries around the world, from South Africa to Romania, but we have also seen authorities and the publics turning a blind eye in countries where corrupt behavior was disclosed. There were no crowds in the street to protest the systematic tax evasion of elites in developed countries following Paradise Papers: no public outcry in reaction to the diesel cartel revelations in Germany. Donald Trump has positioned himself as an enemy of the ethics that underlay the institutional infrastructure, which had served US executive so well after Watergate, opening a battle against public integrity that other presidents in less democratic contexts, like Turkey’s Erdogan, seem already to have won, bending judicial independence to suit their needs. When news is mixed, we can turn to stats to see what they can tell us to answer the question if 2017 was a good year for the global crusade against corruption or just one more year.